Mountainsmith Mountain Tipi is a 2-person 3-season non-freestanding double-layer reliable tent built in the old style but with modern and advanced materials. Three ways of using it. This Mountain Tipi is available on Amazon. They have an excellent shipping service globally so you might save on shipping. Note that the price on the manufacturer’s site is exactly the same. The tent only, this is what you have seen in the top picture above. This provides complete protection from insects, spiders, and snakes, and this is very suitable in summertime situations without rain so you can save lots of weight in the pack. The tent and fly together as shown in the picture below. This offers the maximum possible protection. The fly only. This would be a shelter option against rain only. The structure is supported by a single aluminum pole and it is therefore not freestanding. So bear this in mind when you choose your camping place. Mountainsmith Mountain Tipi with the fly on, note the vents and guyout lines. Capacity-wise, this is a tent for two people, with the area of 54.7 ft² (5.1 m²) this is plenty of space for you and the gear. Seasons-wise & climate-wise, this is a reliable shelter that can be used throughout the year, but you will feel cold if you use it in the winter time. So I would say this is an excellent 3-season shelter with a full coverage rain fly for protection from elements. Weight-wise, with its 6.93 lb (3.15 kg), this is a tent you would not carry on the trail even if you share the weight with a partner. There are much lighter options for such use. So this is a great tent to use at places with motorized access. I have added it to my list with best 2-person tents for camping. The packed size is excellent, (L x D) 20 x 7 inches (51 x 18 cm) so you can transport it even on a bicycle or in a kayak. So this is one only 7000 series aluminum pole with an adjustable length and this allows the height in the range 62 – 66 inches (157 – 168 cm). The canopy is all a No-See-Um mesh that keeps out insects and offers excellent ventilation. It continues to the bathtub floor construction which is 68D x 190T Poly PU with an excellent 4000 mm waterproof rating. The fly is 40D ripstop Sil-Nylon with all seams sealed. Surprisingly, they do not provide the official waterproof rating. Note also that you have one entry point only, both external and the inner doors are with zippers. There are 3 vents higher on the fly. With the air flow from the ground and all the mesh in the canopy, this should be good enough to fight condensation. Interior mesh storage pockets to organize your gear. Reflective guylines to make tripping less likely. They come complete with easy-to-use tension lock cord adjustments. Reflective stake-out points of the tent. A stuff sack is included. Mountainsmith brand offers a Lifetime Warranty against materials and workmanship defects. So this tent comes with their Forged for Life Guarantee, the official Mountainsmith lifetime warranty. Weight: 6 lb 15 oz (6.93 lb, 3.15 kg). 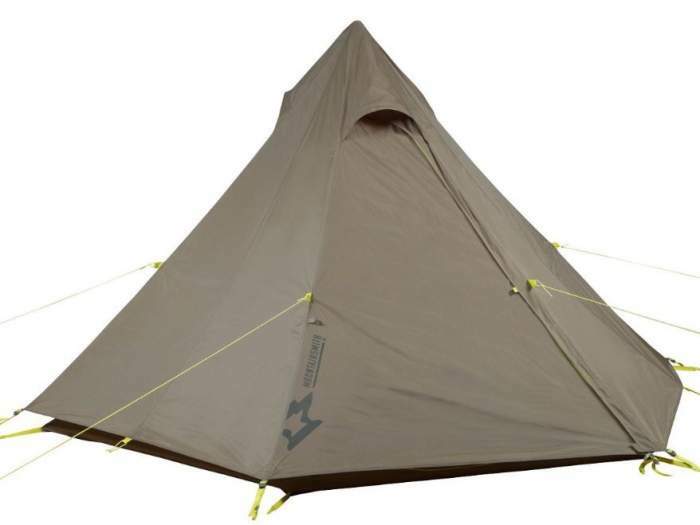 Trail weight (pole plus inner tent): 5 lb 9 oz (2.7 kg). Dimensions: 95 x 110 in (241 x 280 cm). Area: 54.7 ft² (5.1 m²). Peak height: 62 – 66 in (157 – 168 cm). Packed size (L x D): 20 x 7 in (51 x 18 cm). In the summary of this Mountainsmith Mountain Tipi review, I would point out again its versatility and its reliability. This is a product from a renown brand and it comes with a warranty that should put your mind at ease. It is not the best option to carry long distances but its packed size is good and this is indeed doable if you and your partner share the weight. Note that this is not a sponsored text and I have no relation with the brand. Please use the comment box below in the case of questions or comments. I wish you a nice day and pleasant camping.